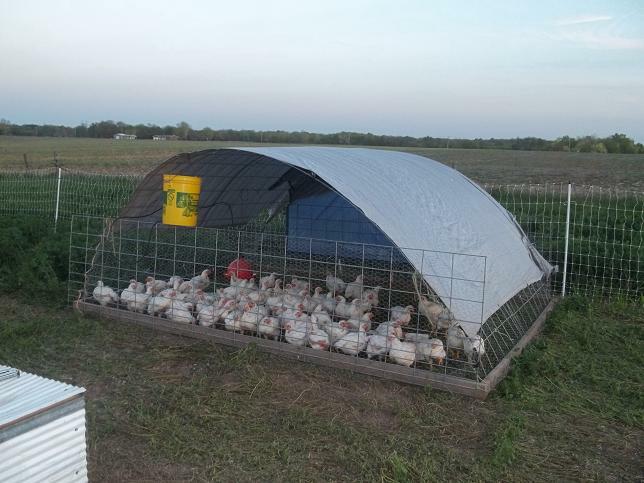 We built our recent chicken tractors after those of Joel Salatin. The term Chicken Tractor, as near as I can tell, is something Andy Lee gave us. 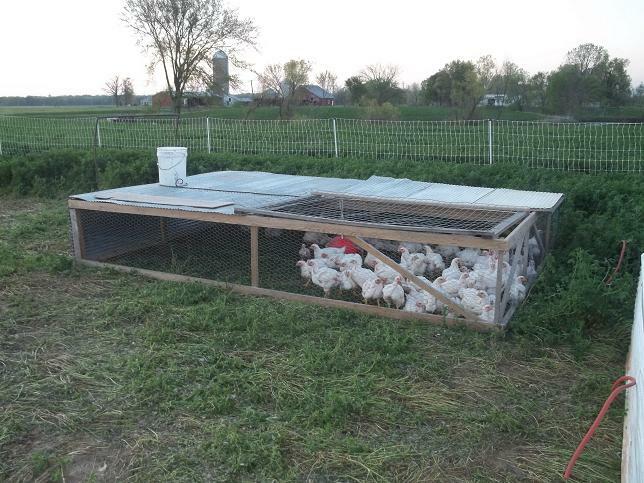 In Pastured Poultry Profits Mr. Salatin describes a 10x12x2 structure that is lightweight and fairly easy to move. We built ours as 12x8x2 but otherwise the original tractor is quite similar. We built it out of scrap material we had laying around. What could be better? …or heavier? That thing is a tank. It has all kinds of bracing and is made with heavy steel siding rather than the prescribed aluminum. But, it works. When we were designing the second tractor we went with fewer braces and lighter steel. The result was better but not great. It may not look a lot different but it is a lot lighter. I was bitten by the bug. I built a third chicken tractor to see how light I could make it. Further, I built the third to address a serious issue, heat. I left the sides off entirely so the wind could blow through and keep things cool inside. It worked remarkably well. It is light but won’t blow away in 50 mph March winds. It stays much cooler than the other two tractors. But there is a problem. This spring I have lost zero chickens in the other tractors but I have lost four in this one. Four. For those of you playing the home game, that’s a big number. There appears to be something about that open side that stresses the birds. I now have a tarp covering the South side of the tractor as it is light, portable, inexpensive and temporary. That takes us to the fourth tractor design, a radical departure from what we have seen so far. This tractor is the cheapest to build, the fastest to build and the most versatile. I took one side off for the winter and raised 6 hogs in it. I could imagine putting weaner pigs in one and moving it daily like they were chickens until they were big enough to escape, though I suppose one could wrap the interior with electric fencing to keep the pigs from rooting out. I could also imagine using it for a calf shed or a hoop house. The point is, it’s multi-purpose infrastructure. We see these as the future of our fleet. All four tractors use Plasson bell drinkers that are gravity-fed from a bucket. We use 4″ PVC pipe cut in half lengthwise as a feeder. Take a moment to imagine your perfect chicken tractor before you build it. After you build it, take notes on what you would like to do differently. Don’t be afraid to break from the norm. By your third or fourth tractor you may have something that fits your organization’s goals. 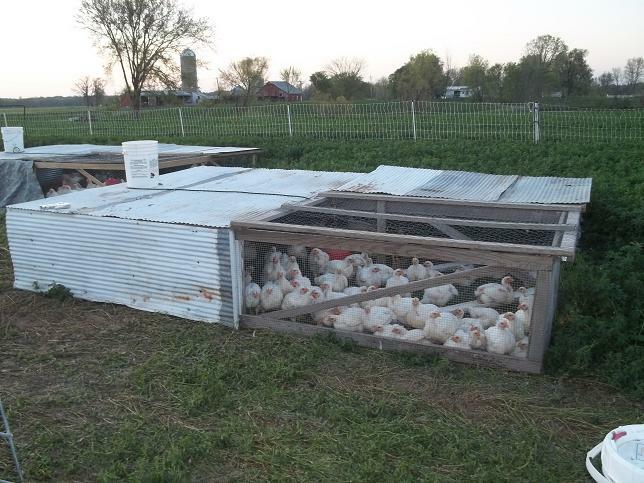 Mac Stone of Elmwood Stock Farm says before long you’ll end up with a whole fence row of what you thought was the perfect chicken tractor design. This entry was posted in Pasture Management, Pastured Poultry and tagged Andy Lee, Chicken Tractor, Joel Salatin, versatility. Bookmark the permalink. ← What do pigs do? So been there. We built our first one out of pallets. Not only did it take both of us to lift it for dragging (no dolly back then), but it was about 4 ft high, meaning someone had to climb in to get the feed out. We were highly motivated to build a Salatin pen, which has been absolutely fabulous, especially with the dolly. I like your cattle panel pen, very versatile, does the tarp stay put in bad weather? The tarp has been a good thing. We have never lost it but we have had a tarp strap give in high winds. I would rather the tarp strap give then allow the whole structure to act as a kite…which happened once. Is the net fence in the bkgrnd for extra security or do you day range? Have you tweaked this version of tractor since this post? Do you tether it on windy days or has it only taken off once? This looks like a good multi purpose tractor that could work for a few sheep too. I came across your blog in Dec and thoroughly enjoy – it is educational and thought provoking and I am reading from the beginning to end! Those hoop chicken tractors are great. We have adapted the design for our laying flock as well. We have also raised pigs in them. If the wind picks up the tarp should blow off. That’s the plan anyway. We had a the tarps secured with tarp straps when a major storm came through. The storm carried the chicken tractor about 10 feet. We found the tractor laying flat. A few screws later we were back in business. The perimeter fence keeps the chickens safe from predators. 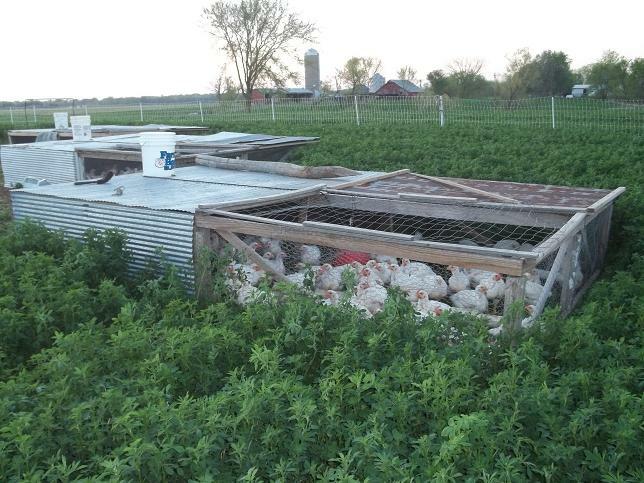 There is nothing about this chicken tractor design that is raccoon-proof. We are apparently the center of the world’s raccoon population. We don’t day range for a number of reasons including the idea that the chicken tractors are a fertility tool.